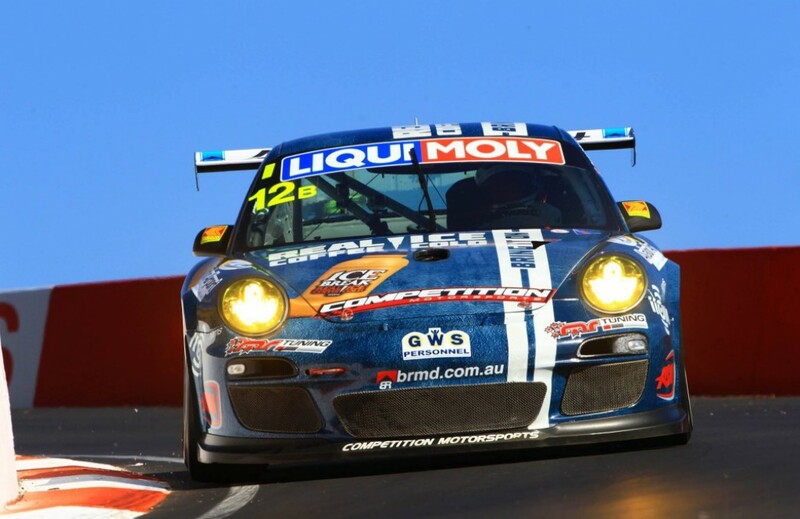 IceBreak Competition Motorsports has finished second in class and ninth outright in the 2014 Liqui Moly Bathurst 12 Hour. The combination of David Calvert-Jones, Alex Davison and Patrick Long experienced a competitive but challenging race, particularly in the final hours of the event when the team’s two-lap Class B lead was eradicated following tyre punctures and intermittent mechanical problems. Davison started the race strongly from 17th outright to move into 13th on the opening lap. Strong pace and strategy and good early reliability helped the team to the Class B lead by the halfway mark, despite a right rear puncture while Calvert-Jones was at the wheel after four hours. With a healthy lead at the time, Davison pitted for a new front splitter before Hour 7 after hitting an errant tyre carcass on Conrod Straight. Impressive stints from Bathurst debutant long and unseeded Calvert-Jones followed until yet another right rear tyre failure hit towards the end of the eighth hour. The team was dealt an unfortunate hand by the Safety Car once its nearest challenger, the #4 Grove Porsche took the class lead and had its margin dramatically increased when the Safety Car waved Earl Bamber through and to the back of the queue, while #12 was forced to stay behind the leader. A fuel pick up problem inside the final two hours beset Calvert-Jones, who returned to the pits on reserve fuel. Davison took over the stint to the flag and not only battled an intermittent gearbox issue, but contended with fierce cabin temperatures following a joint decision with the team to not use a cool suit which saved pit lane time by approximately five seconds. The hard-charging Davison escaped contact with one of the slower MARC Focus entries on Conrod Straight in the final hour, which resulted in a right front puncture en route to an eventual ninth outright and second in Class B at the end of 282 laps. In the process, the team surpassed the previous Class B distance record of 282 laps, set in 2011 by the 997 GT3 Cup of Lago/Kingsley/Russell.